Freight charges under air freight (including air shipment & international express courier shipment) and LCL sea freight are calculated on the basis of Gross Weight vs. DIM/Dimensional Weight, which one is heavier. The heavier one will be taken as the chargeable weight, and this is the weighing you need to pay (also known as Billable Weight). If you are not familiar with dimensional weight, and confused by chargeable weight calculation, believe me, you are not alone. We’ve been asked for many times about this topic, which is indeed not an easy understanding glossary in logistics industry. Just keep reading, and we hope the information below will help you clear your thoughts & better control your air shipping rates. If we need to define chargeable weight, define two kinds of weight first. 1. Gross weight, is the total actual weighing of a product and its packaging. It can be measured by kinds of scales. 2. 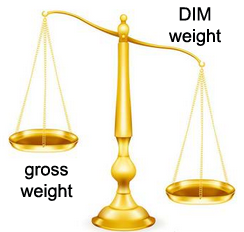 Dimensional weight, DIM weight for short, also known as volumetric weight, is calculated as Volume / (Dimensional Factor). For example. If a common carton, then (Length x Width x Height) / (Dimensional Factor). Dimensional Factor, or shipping factor is a number defined by the carriers. And it can be varied from country to country. After you calculated dimensional weight, then compared with the actual weight of your cargo. Which is heavier, which is the billable weight. Attention: Most Chinese suppliers use Metric system in their Packing List, kg or ton, cm³ or cbm. Make sure use the same unit before any calculation. For example. If a shipper exports cotton, the actual weighing of cotton is very low but occupies a good amount of space as a volume. In this case, if air rates are charged on the basis of actual weighing of cargo, it’s unfair for shipper pay a very large amount money who exports iron plates. Different cargo types have different volume/weight ratio. Some may weigh less but have a larger volume. Some may weight heavier but have a smaller volume. It’s all about balance for air carriers. Take for instance 1 ton of steel as compared to 1 ton of cotton. The latter will occupy more space than the former. Here, the volume of cotton is much higher than that of steel, even though it weighs the same and will require more space on the carrier. Here is the importance of volumetric weight by considering volume of cargo and actual weight of cargo at an equilibrium point. If you consider this factor you will understand the significance of this shipping term and why it becomes important to consider actual weighing and volume of cargo. In order to calculate how much weight you are going to pay, you need to have measurement of package of goods. You can just pick up the data from the sheet your vendor provided, and do the calculation yourself. If the measurements are taken in centimeters, then the formula for calculation will be total volume (cm³) divided by 6,000. If the measurements are in meters then the formula that is applied for calculation will be total volume (cbm/m³) divided by 0.006. If the measurements are taken in centimeters, then the formula for calculation will be total volume (cm³) divided by 5,000. If the measurements are in meters then the formula that is applied for calculation will be total volume (cbm/m³) divided by 0.005. Your supplier in China will send you a box with the length 100cm, width 80cm, height 60cm, and gross weighing 50kg. All airlines will check this calculation for their final invoice. We have made an excel tool for easy calculation all by yourself. Click here to download. It’s free. In practical work, not only just the air shipment but also LCL shipment needs to calculate the dimensional weight for the chargeable unit. The rule is when calculating ocean cargo for LCL 1 Cubic Meter (CBM) is equal to 1 metric ton (1,000kgs). This means that any cargo with volumetric weight of 1 CBM would be considered as weighing 1 metric ton, and the transport charges would be levied accordingly. Conversely, if the volumetric weighing is more than 1CBM, then the rates for LCL is calculated based on the higher of the two values of the gross weighing and CBM. A pallet with length 1.2 mtrs x width 1.2 m x height 1.5 m and gross weight 1 ton. Actual gross weight 1 ton VS dimensional weight 2.16 ton (1.2x1.2x1.5), so take 2.16 to calculate shipment charges. You can just compare the number of measurement (cbm) with the number of gross weight (ton). Choose the larger number. Please note: China freight forwarders also have a minimum dimensional limit of 1 metric ton or 1 CBM. The freight charges are levied for the minimum chargeable measurement in case the shipment less than 1 metric ton or 1 CBM. Transportation costs may be a deciding factor in determining how competitive a business is within the marketplace. The cost of shipping an item depends on both its actual weight and its dimensional weight. All international carriers use the higher weight to determine delivery charges. 1. If air cargo, no matter transported by airline or international express courier, just download our free tool for easy measuring the chargeable calculation. 2. If LCL sea cargo, choose the larger number from the volume in CBM and the weight in TON as the chargeable weight. 3. You can seek help from us. CFC does not have a “one size fits all” approach to our business. We realize that every company is unique and we are able to customize our solution(s) to meet any business requirements. We route all shipments on the appropriate carrier, based on shipment characteristics (location, weight, size and cost) and so customers are not incurring any unnecessary freight charges. Shipping from China is easy when you find the experts. Please feel free to let us know if any questions.